Update June 2016 - this restaurant was severely damaged in the April 2016 earthquake and subsequently closed. Cuando el respeto, la lealtad, la responsabilidad y el amor al trabajo han sido demostrados suficientemente, en mi corazon y en mis fuerzas, estan ustedes queridos colaboradores y empleados de "ARENABAR". Gracias Carlitos, Cecilia, Fanny, Maricela, Alfredo, y, otros que no estan presentes en la foto como Darwin, Jacinta, Miguel...hasta el 16 de abril/016 . La Vida va a permitir que nos volvamos ha abrazar !! Bahia de Caraquez, en Manabi, Ecuador. 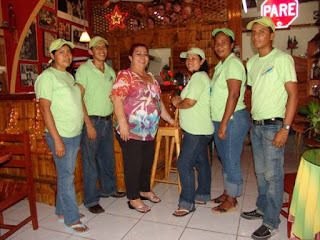 Serving patrons on the coast of Manabi for 18 years "Arena Bar" Restaurante y Pizzeria debuted operations on a new stage. On the beautiful starlight evening of June 19th, 2014 a group of clients & friends gathered to share Padre Bruno's blessing of the restaurant's new welcoming location. We have often enjoyed the eateries hospitality & cuisine over the last several years with family & friends. In fact at one time we lived in the apartment above Arena Bar. Now it clearly boasts the finest ambiance for dining in Bahia de Caraquez, with exceptional service and attention from the staff, international rhythms as background music, and an eclectic surf & art deco décor. Pizza is the house specialty, but a variety of salads, pastas, and sandwiches are available. Several themed rooms - surf, art, romantic, famous actors & movies, influential leaders - with lighting and music providing refined and luxurious ambiance. Seclusion for an intimate dining experience can be found beyond the arches in the romantic room, comfort for private parties, or an informal gathering of friends in any of the others. One of the defining features of Arena Bar are their beautiful natural tables made from large Samango tree burls native to the northern coast of Manabi. The house is full of a magnificent photo collage collection of celebrities ranging from the Beach Boys, Princess Diana, the Pope, Marilyn Monroe, the Beatles, Madonna, Charlie Chapman, Julio Cortazar, Che Guevara, World Vision, and Andy Warhol. a fine collection of famous Ecuadorian faces above the bar, and several original works of art grace the walls. A variety of international music completes the ambiance for your dining experience. Outdoor patio areas richly decorated with cultural ornaments and tropical plants allow for dining under the stars with a fresh ocean breeze. From the kitchen the menu provides traditional & unique pizzas along with a cornucopia of culinary creations. Only the finest and freshest ingredients are used to satisfy palates that appreciate cuisine with a worldly flair (this is not a trivial challenge for restaurants in Bahia where customer traffic varies so widely). They have the best selection of salads with olives and cheese available in Bahia de Caraquez. In addition to pizzas, entrees range from simple sandwiches , pastas, lasagna, fresh fish fillet in a passion fruit sauce ( one of our favourites ) shrimp and chicken dishes. Excellent pizza with a medium crust and a wide range of innovative toppings. The most popular signature pizzas include : "Arena bar" the house meat & olive special, "Spicy" a delightful combination of ginger & garlic. "The Sea" a combination of seafoods. "Sinful" a combination of tropical fruit, strawberries, & peaches smothered in chocolate & cheese. Desserts include decadent chocolate cake, or tropical fruit salad with chocolate sauce. The Bar compliments your meal with a full selection of exotic tropical fruit cocktails, a selection of ice cold beer & wine, fruit milkshakes, teas, coffees, hot chocolate, cappuccino, and mochachino. As noted in our previous article " Bahia Reflections" - in Latin culture - history is preserved orally and not well documented. We take this opportunity to preserve the origin & history of Arena Bar. Originating from a young surfer's travels of the Ecuadorian coast from Salinas to Mompiche in search of adventures and waves. Knowing the area well, in 1996 Santiago Proaño ascertained Canoa needed accommodation, good music, and refreshments for the young surfing crowd. Departing from his studies and career as an aquaculture technician he moved to Canoa to build " Arena Bar". Without any capital resources he lived in a tent on Canoa's beach and started to build a bamboo structure with palm leaf roof to become the original " Arena Bar". It took 25 days to construct and on February 16, 1996 - the first day of Carnaval it was opened for business. Primarily a refreshment bar serving snacks, sandwiches, and breakfasts. For the next four months he lived in the tent while he built his house with an open front to enjoy the ocean and sunset views. today a significant community with no fewer than 25 hostals & hotels with 100's of beds available, and many restaurants. Presently over 95% of the population works in the tourist service industry. This is a pretty drastic change for any community in less than two decades – add to that the social pressures resulting from an influx of several dozen gringos who are constructing "dream homes" on this stretch of coastal beach. Essentially the great food, excellent customer service, creativity and innovation, and good music - (classic rock & roll and current salsa & merengue ) originally established, continue today. Arena Bar's early clients were an interesting mix of surfers, cute bikini clad girls, rich Quitoneans, and middle class Ecuadorians. The village of Canoa was like one large family and Santiago had become a vibrant part of the family. As a successful entrepreneur he expanded into tours of the area, provided accommodation, produced silk printed t-shirts, a variety of crafts, and rented surfboards and provided lessons. In November 1997 the torrential rains of El Niño hit causing landslides which isolated Canoa for over a month. The two rivers swelled and made travel across to San Vicente impossible. One evening the mighty Pacific waves swallowed the restaurant, his home and their contents. It took several years to recover emotionally & financially, but in 2000 Santiago returned to Canoa to rebuild Arena Bar, bigger and better than before. After a year, having rented the land, the land owner was envious of the restaurant's success and evicted Santiago prematurely so his own son could take over. Full of energy & spirit Santiago rented another site and commenced building the third facility. Once again bigger, better and more formal he expanded the menu to include seafood. It was not all roses though: summers were harsh weather for Canoa windy, cloudy, & chilly, without tourists; water supply was severely limited; power supply unreliable – where rain would cause 24 hour blackouts; the informal environment created unreliable & irresponsible staff; theft was a very real challenge; jealousy of success often reared its head; and the operational challenges created by frequent food supply shortages. Restaurant choices in Canoa were still minimal but the visitor numbers were increasing. At night Arena Bar provided good food, music and a place for visitors to gather and socialize. Santiago describes "Arena Bar as the place where dreams come true for many people. My birthdays were famous because I gave away free caipirinhas all night long". When is your birthday Santiago ? For those who are familiar with the Canoa area, Santiago was somewhat of a visionary pioneer as this location is currently the " Surf Shack " - essentially the centre or heart of current-day Canoa. Operations continued successfully until Santiago's wife Laura needed to return to the U.S. in order to finish her Master's degree. He rented a new location in Bahia de Caraquez for "Arena Bar" and his mother Elizabeth Alvarado assumed management. It has continued to operate successfully in four different locations in the ciudela of Bahia de Caraquez. Elizabeth and her 5 staff would love to host your next occasion or have you drop by for dinner, or drinks and conversation.